The news is full of confidence surveys in which consumers and business people say how confident they are that the economy is getting better and the future looks bright. There’s just one little problem: they aren’t acting it. They aren’t walking the talk. 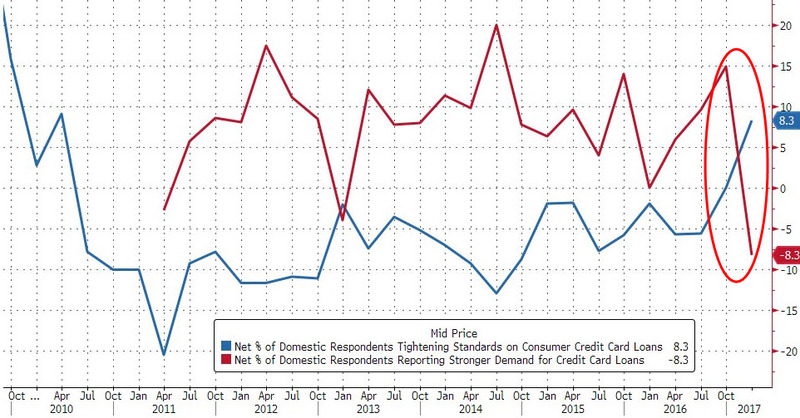 In the 2017 Q1 Federal Reserve Senior Loan Officer Survey just released, demand for credit card, auto, residential mortgage and commercial and industrial loans has plunged in the last three months, despite soaring confidence, spiking optimism and big gains in the stock market. And we all know that this economy runs on credit. Here’s the chart. Note the red circle which highlights the abrupt shift down since early October. 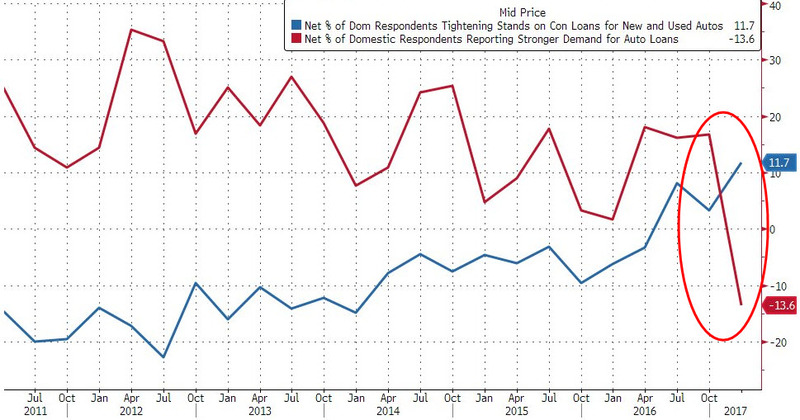 The Fed Survey shows that lending standards on commercial and industrial loans and residential mortgages are largely unchanged…the banks are willing to lend but demand is down. Lending standards on commercial real estate loans continued to tighten. Banks are losing interest in making consumer instalment loans and demand for these loans softened as well, particularly for auto and credit card loans. Credit card loan demand in particular has crashed while lending standards have tightened to nearly seven year highs as the chart below illustrates. 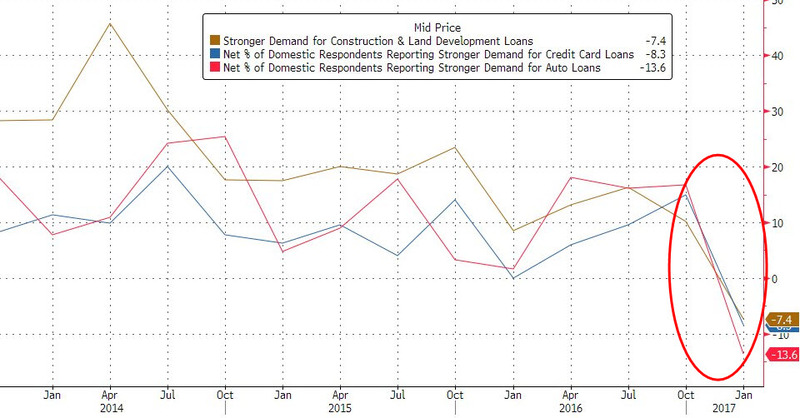 An even bigger problem for the American economy is auto loan demand which is plunging at the same time that lending standards are tightening drastically. Unfortunately, inventories of unsold cars are also soaring…not a good combination for the auto-dependent U.S. economy. Perhaps like me, dear reader, you are looking in vain for the expected Trump economic miracle in the above charts. It’s not there. All talk and no walk, I say. Bad news to follow. Wayne Wile is an international investment advisor with more than five decades of experience in wealth management. He has spent the majority of his career working with institutional and high net worth investors, seeking to mitigate risk while optimizing portfolio performance. Wayne began work in the mailroom of a brokerage firm when he was 17 years of age and rose to a senior executive position. He was recruited for key jobs with several nationally recognized investment firms in Canada before striking out on his own. Wayne resides in the Cayman Islands but considers himself a citizen of the world.